1. Binds your Outlook contacts with the Google ones by synchronizing them. Syncing is performed one- or two-way interaction. 2. Free version of Outlook4Gmail syncs only one Google and one Outlook account while 7-day trial and full versions of the tool performs simultaneous synchronization for numerous Google accounts with your Outlook account. 3. Syncs Outlook and Google Calendars, which helps to boost your work life as now all your appointments and events are within the hand’s reach. 4. With the opportunity of automatic frequent synchronization, all events and appointment from your numerous accounts will be synced and updated as often as you want them to. The new version of Outlook4Gmail (4.6.1) has an improved interface, easier synchronization patterns, and much better functionality. non-standard font sizes and DPI settings support. Scand Ltd. and its development team are happy to create helpful software and our goal is to make it even better. Outlook4Gmail 4.6.1 version is not the full stop for our progressive team as we are in the process of adding new essential features. Outlook4Gmail has its limited version available for free, to get it, click here. A full commercial version with a year client support and free updates are also available. 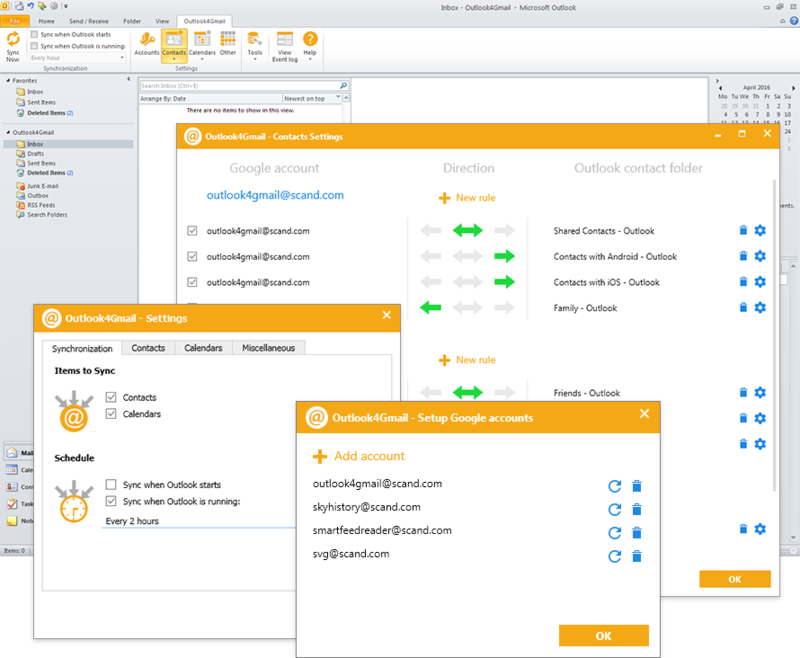 More information on our free and full versions you can find on Outlook4Gmail product page. Stay tight, keep up with our new updates and follow Outlook4Gmail social network group. Contact email to drop us a line: outlook4gmail@scand.com.